The University of Texas Longhorns new head football coach Charlie Strong from Louisville speaks after being introduced during a press conference January 6, 2014 at Darrell K. Royal-Texas Memorial Stadium in Austin, Texas. 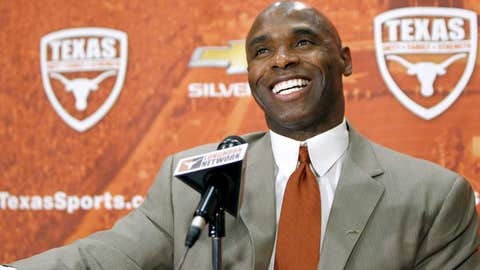 Charlie Strong won’t do it alone. The new Texas coach officially announced his coaching staff on Wednesday. Vance Bedford, who worked with Strong at Louisville, will join Strong’s staff at Texas as defensive coordinator. Former Oklahoma State offensive line coach Joe Wickline will serve as offensive coordinator and offensive line coach. Wickline will serve as playcaller. Strong’s coordinator at Louisville, Shawn Watson, will be an assistant head coach for offense and coach quarterbacks. Chris Rumph will coach defensive line and be an assistant head coach for defense after serving in the same position at Alabama from 2011-13. Strong was hired from Louisville on Jan. 5, and his staff will boast 232 years of coaching experience.